April 23rd Brighton Komedia SOLD OUT! April 27th Oxford 02 Academy SOLD OUT ! May 2nd Manchester Ruby Lounge SOLD OUT! May 11th London Shepherds Bush Empire SOLD OUT! Keane will release their debut single 'Silenced By The Night' on 30th April 2012, taken from their fourth studio album titled 'Strangeland', released on 7th May 2012, through Island Records. Keane performed the worldwide premier of the single on Monday's Jimmy Kimmel show in Los Angeles. As a long-time supporter when he discovered the band are making their debut appearance at this year's SXSW Festival, he immediately booked them for the first performance of the new song. Keane recorded 'Strangeland' with producer Dan Grech (Radiohead, The Vaccines, Howling Bells, Lana del Rey) in the UK at Sea Fog, Ivor Novello Award winner Tim Rice-Oxley's studio. They are calling it their most personal and honest record yet. The British multi-million selling band are now a four piece with the addition of new member bass player Jesse Quin who collaborated with Rice-Oxley on Mt. Desolation. 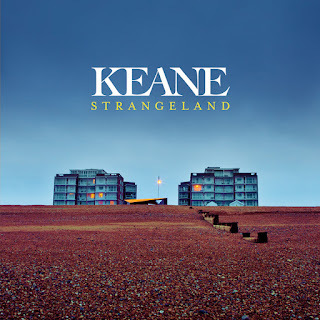 There are certain songs on 'Strangeland' which, at a stroke, are unmistakably, quintessentially Keane, a real once-heard, never-forgotten moment. 'Silenced By The Night' is one of those songs, an emotionally driven anthem, boasting a hook so huge you could raise the Titanic with it. The redemptive declamations of 'Silenced By The Night' is the first clue in the series of songs on this album that tells us what this body of work is about. It is yet another example of Keane’s ability to alchemise complicated emotions into songs of deceptive simplicity, that fantastic unidentifiable thing that distinguishes a good song from a great one. Your thoughts immediately turn to indisputable Keane classics like ‘Somewhere Only We Know’, ‘Everybody’s Changing’, ‘Is It Any Wonder?’, ‘The Night Sky’ and ‘Spiralling’. To that list will surely add a few more from the new album. All are reminders that Keane have never been afraid to cast their net wide for sonic and lyrical inspiration. Four years have elapsed since Keane’s last album ‘Perfect Symmetry’; two since ‘Night Train’, the mini-LP which followed its three full-length predecessors to the top of the British album charts, securing them a place in pop history. If Keane’s feverishly loyal fanbase wondered what the group’s next album would sound like, they weren’t the only ones. In the eight years following the release of 2004’s 9× platinum Brit award winning ‘Hopes & Fears’, every Keane album has marked a clear progression from the previous one: the anxious emotional terrain mapped out by ‘Under The Iron Sea’; the iridescent poptimism of ‘Perfect Symmetry’ featuring the electro charged hit song 'Spiralling', voted Q Magazine’s 2008 Song Of The Year. On finishing the recording of the new album in February Keane announced two special shows on 9th and 10th March at the De La Warr Pavilion in Bexhill, a location close to their hearts as it was both their teenage haunt and near to where the album was recorded. They announced the dates in the local paper only and within 5 minutes they were sold out. Tim Rice-Oxley recently said of the album: "'Strangeland' feels like an adventure that brings with it different things for different people, and like any adventure is full of uncertainty, and the potential for mishap, as well as the possibility of amazing things and glorious discoveries. I love the idea of the journey through 'Strangeland' being a journey of redemption." 2011 was an incredible year for Nicki, with her multi-platinum selling debut album PINK FRIDAY boasting the most charted singles by any female rap album in Billboard history. Nicki also became the first artist to have 7 singles on the Billboard HOT 100 chart simultaneously. She criss-crossed the US playing to massive sell-out audiences with friend and mentor Lil Wayne on the sold–out “I Am Music II” tour and then slayed audiences as the special guest on Britney Spear’s US tour. In addition to winning Best Hip Hop Video at the 2011 MTV Video Music Awards along with Favorite Rap/Hip Hop Album and Favorite Rap/Hip Hop Artist at the 2011 American Music Awards, Nicki was recently nominated for three Grammys for Best New Artist, Best Rap Performance, and Best Rap Album Nicki’s feverishly anticipated new Young Money/ Cash Money album “Pink Friday: Roman Reloaded”, was released on April 2nd, featuring her brand massive number 2 hit single “Starships” which was produced by multiple Grammy-winning producer, musician, and songwriter, RedOne, whose 35 international hit singles include a staggering 18 #1 singles, for the likes of Lady Gaga, Jennifer Lopez, Usher, and Mary J Blige, to name but a few. “Starships” shows Minaj headed straight into clubland territory - that means heavy synths, an infectious chorus and fist-pumping breakdowns. With 3 million albums sold globally, 15 million likes on Facebook, over 10 million followers on Twitter and a profile that is rising by the day, 2012 looks like being an even bigger and better year for this 5’ 2” phenomenon. Fresh from his recent triumphant sell-out UK Arena dates, Grammy nominated superstar, and without question one of the most interesting rap artists to emerge in years, Drake, releases his brilliant new single “The Motto” released on April 16th through Young Money/Cash Money Records. The single features friend and mentor Lil Wayne as well as label mate TYGA and is taken from the Canadian’s hugely acclaimed new album “Take Care” which has already sold over 200,000 in the UK more than doubling sales of his debut set “Thank Me Later” which went Gold in the UK. The huge success of the album coupled with the sell-out UK tour including 2 consecutive nights at the O2 in London performing to over 38,000 fans, proves that Drake is a genuine superstar and is about to get a whole lot bigger. Facebook likes stand at well over 23million, Drizzy can count on almost 7 million followers on Twitter while combined Youtube views are in excess of a staggering half a billion, not to mention his UK number 1 single with Rihanna on “What’s My Name”. Drake exploded onto the scene with the enormous success of his classic single “Best I Ever Had” which peaked at no.2 in the US charts, and since then there was no doubting that the 26 year old, born Aubrey Drake Graham, would become the hottest property in hip hop and that his debut album would be the most feverishly anticipated long player in years. Drake has already enjoyed Top 10 chart success in the UK as a key member of the Young Money collective whose single “Bedrock” was a huge hit in the UK. Solo chart success soon followed with the hit singles “Over” and the Kanye West produced “Find Your Love”. You will also have heard Drake’s distinctive flow on big singles from the likes of Jay-Z, Eminem, Alicia Keys, Kanye West, Lil Wayne and Mary J Blige to name but a few. Dubbed “the UK’s answer to John Legend”, South Londoner Josh Osho is a naturally gifted singer-songwriter with one of the finest pop/soul voices to come out of the UK in years and a life-story packed full of the stuff that films are made of. Born to a half Northern Irish, half Nigerian mother and Nigerian father, Josh Osho, has not only experienced more than your average 20 year old, but more than many people may do in a lifetime. Following an unconventional and often tempestuous childhood, Josh went from being in and out of home at the age of 16 and dealing drugs from notorious half-way house Ebenezer hotel at 17, to signing a record deal at 18, and finding himself recording in a studio with two members of the Wu Tang Clan at 19. It may be a universal cliché to say someone has been saved from a darker route in life by music, but when it comes to Josh Osho this really is the case. He is a young man and artist who has come up the hard way and it is there for everyone to hear in his music. Among those to hear it first was Record Company co-president and A&R man Darcus Beese (Amy Winehouse, Jessie J, Rizzle Kicks), who signed Josh to Island records, and the legendary Ghostface Killah who approached Josh about guesting on his debut EP, ‘Redemption Days’. A few sessions in the studio later and Ghostface’s counterpart RZA quickly followed suit, stepping up as the executive producer on Josh’s forthcoming debut album, ‘L.I.F.E’. Now Josh has garnered another fan among Hip Hop’s finest. Hot new star Childish Gambino invited him to support him on his recent sold out London shows and has guested on his forthcoming ‘Giants’ EP. The much talked about Gambino has been championing Osho to his significant social media following over 500,000 twitter followers. Another heavyweight promoter has been his ‘Redemption Days’ collaborator, Ghostface Killah, who on hearing Josh’s cover of ‘Jesus Walks’ reached out to Kanye West via Twitter to hook them up together. Stay tuned. It’s not only stateside love that Josh has been receiving. The likes of James Morrison, Emeli Sande, Dappy and Wretch 32 have all tipped Josh as a talent to watch out for this year, while Josh has also been busy collaborating with a host of burgeoning homegrown talent. From RnB silken voiced crooners Angel and Cleo Sol to rising MC star, Marger, whose recent EP ‘The Marger EP’, (featuring Josh) debuted in the top 5 of the UK Hip Hop charts. The ‘Giants’ EP is an infectious and heartfelt slice of gritty inner city soul (tracklisting below). Complete with a version produced by Midi Mafia (Frank Ocean) and featuring Childish Gambino, alongside remixes from hot underground talent, Sticky and Swindle, ‘Giants’ showcases Josh’s uniquely soulful voice at its best, while also giving a taster of what’s to come from his forthcoming debut album ‘L.I.F.E’, (due for release later this year). Following in the footsteps of such luminaries as Paul McCartney, Nirvana, Bob Dylan, Lauryn Hill, Alicia Keys and Oasis, Florence + the Machine have recorded a session for MTV Unplugged which will be released on CD & download this April. Consisting of some of her biggest songs to date across both her debut album ‘Lungs’ and her recent, 1.7 million selling follow up ‘Ceremonials, this collection of live, acoustic sessions goes further to prove her unique talent. Alongside three of her band members and a 10 piece Gospel choir from New York, Florence played a set that included well known tracks like ‘Dog Days Are Over’, ‘Cosmic Love’, ‘Shake It Out’ and ‘No Light, No Light’. Florence also offered up two brilliant covers of Johnny Cash’s ‘Jackson’ as well as a beautiful rendition of ‘Try A Little Tenderness’. For the ‘Jackson’ cover she was joined by Josh Homme who travelled to New York especially to record this stripped back version of the June & Johnny classic. Earlier that day, Florence and Kanye West had been hanging out at an abandoned house in the outskirts of NY for a US vogue shoot with Annie Lebowitz. She invited him to the show, which he came to with Q –Tip before all heading off to the afterparty, held by Florence & Josh Homme at New York’s legendary Cabin. LADYHAWKE releases her second album, entitled ‘Anxiety’, on May 28th on Modular Records through Island/Universal. Anxiety is the follow-up to 2008’s critically acclaimed, self-titled, debut album, which has now sold over 250,000 copies in the UK alone. The new album was recorded in New Zealand and France earlier this year by producer and long-time collaborator Pascal Gabriel and features ten new songs including the forthcoming single ‘Sunday Drive’, released May 7th. 'I've made an album I'm really proud of, so I just can't wait to start playing with the band again, and touring and having some fun. I can't wait to get back into it' - Ladyhawke. LADYHAWKE recently showcased some of the new album an intimate gig at London’s 100 Club, where she played new tracks alongside classic hits like, My Delirium, Paris Is Burning and Back Of The Van. The night was a huge success with tickets selling out within seconds. 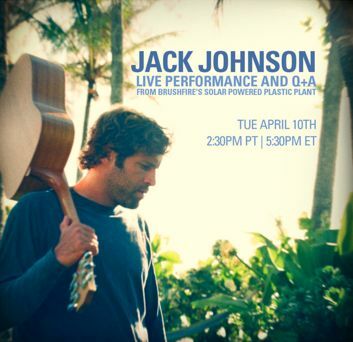 Hawaii native and international superstar Jack Johnson, who has sold over 18 million albums in his 11 year recording career, will be doing a live performance and Q&A on Tuesday April 10th at 9.30 pm UK Time (2:30 PM PST) . Jack, John Cruz and Paula Fuga will also perform a few songs, so get your questions ready, mark your calendar and follow Jack at Livestream. Jack’s brand new Brushfire album Jack Johnson and Friends - Best of Kokua Festival is released on April 16th. The album features a 13-track compilation of live performances from Jack Johnson’s benefit concert for the Kokua Hawaii Foundation. In support of the release, Johnson will also tour the Hawaiian Islands for an intimate seven-date all acoustic tour. Proceeds from Jack Johnson and Friends - Best of Kokua Festival and the tour will benefit the Kokua Hawaii Foundation. Culled from six years of his eco-minded music festival, Jack Johnson and Friends - Best of Kokua Festival, highlights onstage collaborations with legendary musicians like Willie Nelson, Jackson Browne, Eddie Vedder, Ben Harper, Dave Mathews, Ziggy and Damian “Jr. Gong” Marley and more. About Jack Johnson. Jack Johnson grew up surfing and playing guitar on the North Shore of Oahu. He released his first album Brushfire Fairytales in 2001 and, in the last ten years, has released 5 more albums that have sold over 20 million copies worldwide. With his success, Johnson has always tried to take the spotlight and shine it on issues important to him. In 2003, Jack and his wife Kim founded the Kokua Hawaii Foundation and Kokua Festival to support environmental education in Hawaii's schools and communities. Johnson, his Brushfire Records label, and his touring crew have been leaders in the greening of the music industry in all areas of tour production and album packaging. In 2004, Jack became the 50th member of 1% For The Planet and Johnson's 2005 release of In Between Dreams became the first album to carry the 1% label. In 2008, Jack donated 100% of his Sleep Through the Static tour profits to establish the Johnson Ohana Charitable Foundation, an endowment founded by Jack and Kim Johnson to support environmental, art and music education worldwide. 100% of Jack Johnson's recent To The Sea tour was also donated to charity. These tour profit donations, along with Johnson’s personal charitable activities, has resulted in over $25 million donated to charity since 2001. 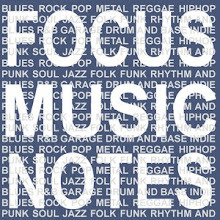 For more information, visit www.jackjohnsonmusic.com. About Kokua Hawaii Foundation. The Kokua Hawaii Foundation is a 501(c)3 non-profit organization that supports environmental education in the schools and communities of Hawaii. The Foundation's mission is to provide students with exciting and interactive experiences that will enhance their appreciation for and understanding of their environment so that they will be lifelong stewards of the earth. While the Kokua Hawaii Foundation participates in a variety of environmental education initiatives in Hawaii, its main school programs are: 3R's School Recycling, Environmental Field Trip Assistance, Kokua Earth Action Projects and 'AINA In Schools. Recently the Foundation introduced the Plastic Free Schools program as part of the Plastic Free Hawaii Coalition to reduce single-use plastic in our islands. For more information on programs and membership, visit www.kokuahawaiifoundation.org.